You want to be a successful snail farmer in Nigeria, right? Then you are at the right place. Snail Farming in Nigeria is very lucrative, and many Nigerians are beginning to see the gold mine in snail farming business. Snail farming is still very under-exploited in Nigeria. How many popular snail farms do you know? Few. That is to show you that the market is still unexploited. We are still struggling to meet demands for fresh snails not to talk of processing and exporting of snails. Snail farming is still very under-exploited in Nigeria. How many popular snail farms do you know? Few. That is to show you that the market is still virgin. We are still struggling to meet demands for fresh snails not to talk of processing and exporting of snails. Since the snails are usually scarce during the dry season, it causes the supply for the snail to be low and demand high, hence price increases. A successful snail farmer will make a lot of money from the harvest of snails from his/her farm. Snail farming could earn you as much as N200,000 to N300,000 monthly, even more than that if you know the secrets of the business. Capital for snail farming is not too much. One could start with as small as N5,000 on a small scale and grow from there. Like any cottage production, small scale snail farming could be carried out in one’s backyard. It does not involve a very large space, hardly falls sick and could eat leftover foods to survive. Besides, anybody going into the business does not have to spend huge capital constructing pens or to create a near natural habitat for them, as snail could breed well in wooden counters. Here, I will be giving a detailed guide on how to setup, sustain a snail farm. And above all, becoming highly successful in snail farming venture. There are some 200 species of snails in the sub-Saharan Africa. For the purpose of snail farming in Nigeria, we will limit ourselves to only 3 species which are commercial, profitable and marketable. You won't want to sell what nobody wants to buy. The commercial species are Achatina achatina, Achatina marginata, Achatina fulica. You should locate your snailery(snail house) an environment protected from the wind or direct exposure to sunlight. Snails love moisture, and so a more humid, cold environment should be suited for your snailery. Though on a small scale it is usually more preferable to use wooden counters for the snail pen, but it is better to build pens with cement blocks because it is more durable, and protect from insects and predators. Free range system is also preferable but the floor should be cemented. A plot of land (60X120) on a free range system could accommodate about 15,000 snails and a decent profit margin after about 6-8months of setting up. If you grow bigger you could even expand to acres of snail farm. The higher the scale the more money you get. To protect against flying insects a wire mesh and window net will help prevent most insects from entering the pen. For crawling insects, apply insecticide around the outside areas of the pen. The type of breeder snails you use to start up your snail farm is going to determine if you are going to be successful in Your snail farming venture. The breeder snails are the first snails you use to start off the snail farm. The snails should have the capacity to start and sustain your snail farming venture. Some factors to consider when choosing your 'pioneer' snails include shell health, age, species, source location, stress factors present in capturing and transporting as well as your own size of farm , the location of farm and type of housing you wish to implement. Snails could be sourced from two major places; on the farm or in the forest and bushes. I always recommend sourcing adult snails from forests or bushes rather than farms because Snails in from farms have had too much contact with 'snail slime' from other snails and this significantly reduces their reproductive capacity and immunity to diseases. Buying snails from markets is even worse because the snails are usually very weak and stressed. Snails sourced from forests or bushes are usually very hardy, unstressed and and more healthy. Snails from farms are 'spoilt kids'. So how do we obtain snails from forests or bushes? Snail hunting: This is usually the normal way of obtaining snails in rural areas. 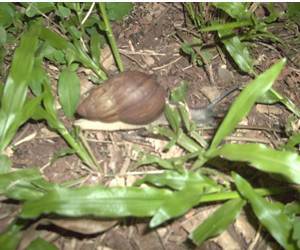 Snails are nocturnal and come out from hiding in the night during the rainy seasons. So going out in groups to pick them is usually the way. Luring the snails: This is done by clearing a portion of land during rainy seasons and spreading out fruits like Paw-paw, pineapple, banana on the area. Come back at about 8pm and pick up snails. Select those suitable for farming. You could repeat the procedure until you get the desired number of snails you want. The first way is faster and a bit dangerous as you have to go to the bushes in the night picking snails. The quantity of snails to be stocked or kept per area should be considered. It is referred to as stocking density. The optimum number of snails an area should be seriously considered if one wants to be successful in snail farming. Why have plenty of snails in a small space or little number in a wider area? Overstocking of the snail pen is never economy. Stocking density affects the growth and breeding capacity of snails. Snails in overstocked pens tend to grow slowly, develop into smaller adults and lay fewer eggs even when food is abundant. Other disadvantages of over stocking are parasitism and high transmission of pests and diseases. Sometimes if the snails are densely packed they may not breed at all. Snails tend not to breed when in a densely packed condition or environment. The slime released by the snails kind of suppresses reproduction. What is the best stocking density? Snails are very easy to feed. Snails eat every organic food source that is non-toxic and household wastes that contain no salts(NaCl). Common food sources include Banana, paw paw leaves, Cabbage, Cucumber, melon, lettuce, Carrot and pumpkin. You could easily get this in any fruit market or salad condiments shop. However, there are formulated feeds for snail farming. This ones are bought with 'cash'. If you are starting small, I know you would not consider buying this feeds when you can easily get them for free in fruit markets, gardens or bush. The type of housing and size of your farm will definitely determine the source of your feeds. You can contact me with respect to that consultation is cheap. Depending on the size of your farm feeding of snails might involve growing snails food, collecting them from markets or even buying concentrates. In feeding snails it should be noted that baby/young snails prefer more succulent or juicy feed sources while older ones might not be too selective on the moisture content of the feed. Though it is still advisable to feed with best feed available for enhanced growth. 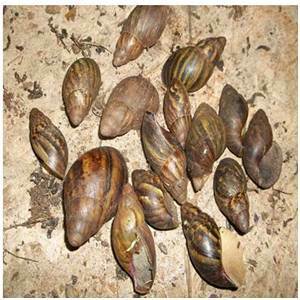 Calcium is very important element snail farming. Why? It is very simple. Shells of the snails, the egg are made primarily of calcium. Hence low calcium in diet will cause slow growth of snails and cause snail shells to be thinner. The egg production/breeding stops or drops drastically due to lack of calcium to form eggs. Snails start eating up walls, paints, and soil in order to seek for calcium. So where do we source Calcium? Calcium can be obtained from two cheap sources. Green outer leaves of cabbage: It is freely available in any fruit/vegetable market in Nigeria. They will even be grateful to you for helping them to carry it. The other cheap calcium source is limestone. Place them in the pens or housing where you rear your snails, the snails will lick them up. You can buy limestone in any poultry shop close to you. Remember don't joke with calcium when it comes to snail farming because it is going bto determine your success in the trade. Snails are hot selling products. Commercial snail farmers don't find stress in the selling of their snails no matter the quantity. Hotels, fast food restaurants such as Mr. Biggs, Tantalizers, will be your regular customers. The truth is that you can never meet thir demands. All they need is your assurance of regular supply per week. There is also good market for snail meat in the international market if only you can do a good packaging. You can make millions of naira from this vast and inexhaustible market. Snail farmers are making huge profit as the global demand for the delicacy increases. In Nigeria the prices of raw, matured snails goes for N250 to N600 depending on the size. You can also process your snails, brand it and sale locally in supermarkets, malls e.t.c. Big malls like Shoprite will be quick to accept your product if your product has high standard. So dear passionate Snail farmer or prospective farmer, I have succeeded in baring all the secrets to a successful snail farming venture. All you have to do is start small and as soon as possible. If you need help consult me in my contact page. Thanks for reading and I wish you a successful farming venture.